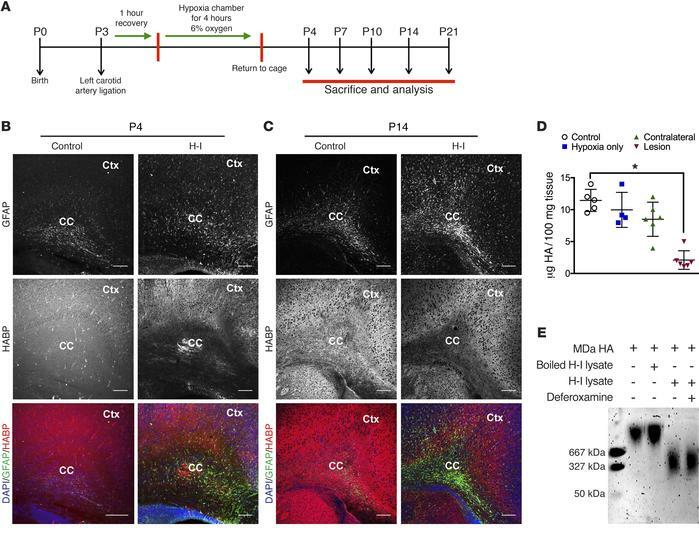 Neonatal rat H-I WM lesions deplete MDa HA. (A) Schematic diagram of the H-I strategy and postnatal ages for tissue analysis. (B and C) Representative images of the supracallosal WM of the corpus callosum (CC) and overlying cortex (Ctx) in control and H-I samples at P4 (B) and P14 (C) stained for GFAP and HABP. Diffuse reduction in MDa HA persisted until P14 (C). (D) Recovery of total HA from WM lesions after H-I. Comparison of true controls (Control), hypoxic controls (Hypoxia only), and H-I group (Lesion) versus contralateral hypoxic hemisphere (Contralateral). Only the lesion group had a significant reduction in HA recovery. (E) Incubation of MDa HA with the lesion lysate generated HAf below ~650 kDa. Lesion-lysate activity was sensitive to heat inactivation but insensitive to deferoxamine (50 μM). B and C: control n = 2; H-I n = 4 animals for each age group (P4 and P14). D: n = 6 (H-I), n = 5 (control), and n = 4 (hypoxia) animals (P7). E: n = 4 separate experiments on 4 different animals at P4 after H-I at P3; one representative experiment is shown. *P < 0.05 by ANOVA. Mean ± SD. Scale bars: 300 μm (B and C).